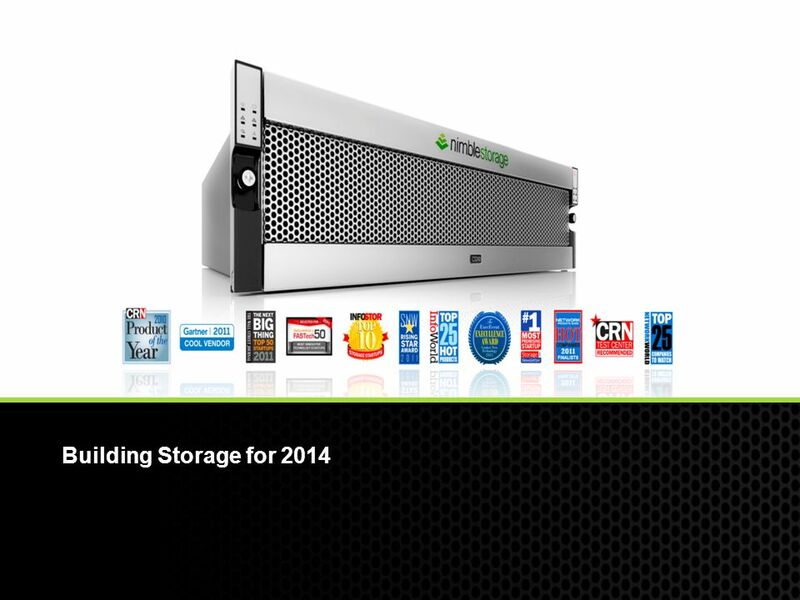 2 Why start a new Storage Systems Company? 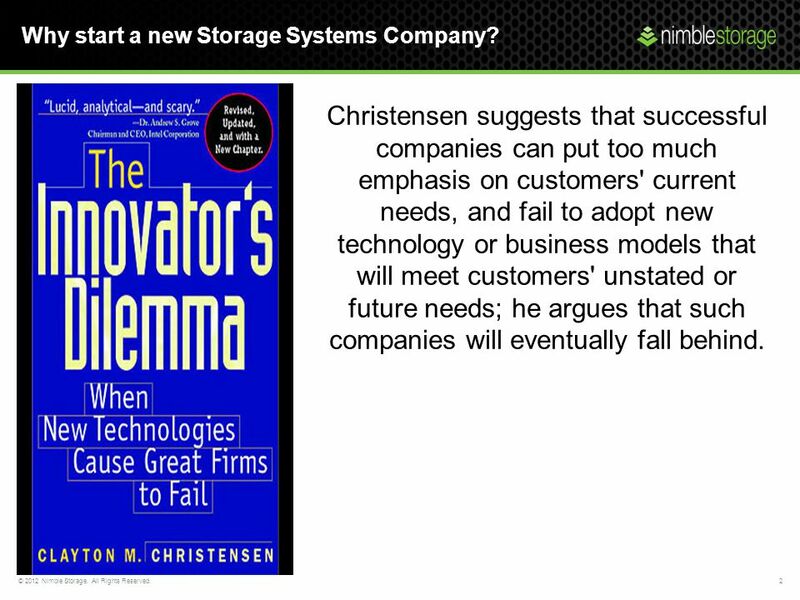 Christensen suggests that successful companies can put too much emphasis on customers' current needs, and fail to adopt new technology or business models that will meet customers' unstated or future needs; he argues that such companies will eventually fall behind. 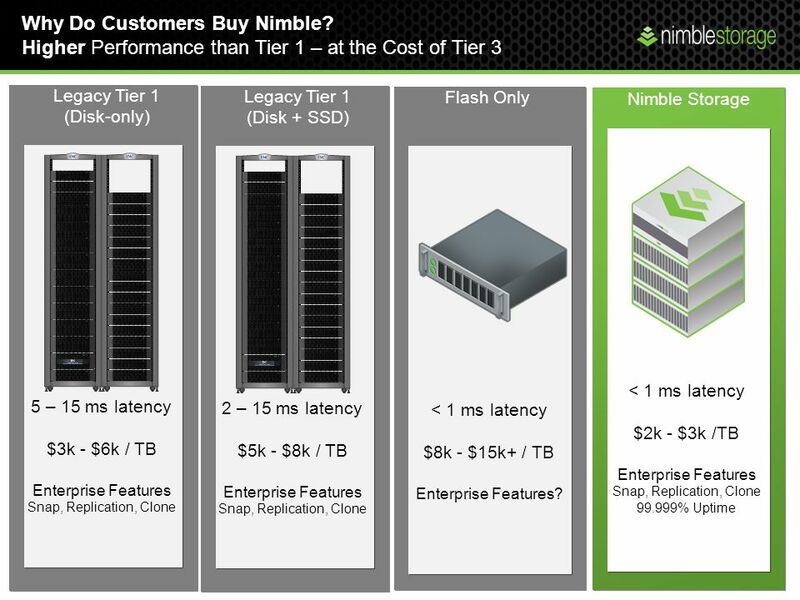 Nimble Storage Is: A public company 10x faster than traditional storage in less space Scalable: From 12TB to 800TB without downtime. Leverages current technology such as Multi-Core CPU’s, Flash Drives and a proprietary file system. 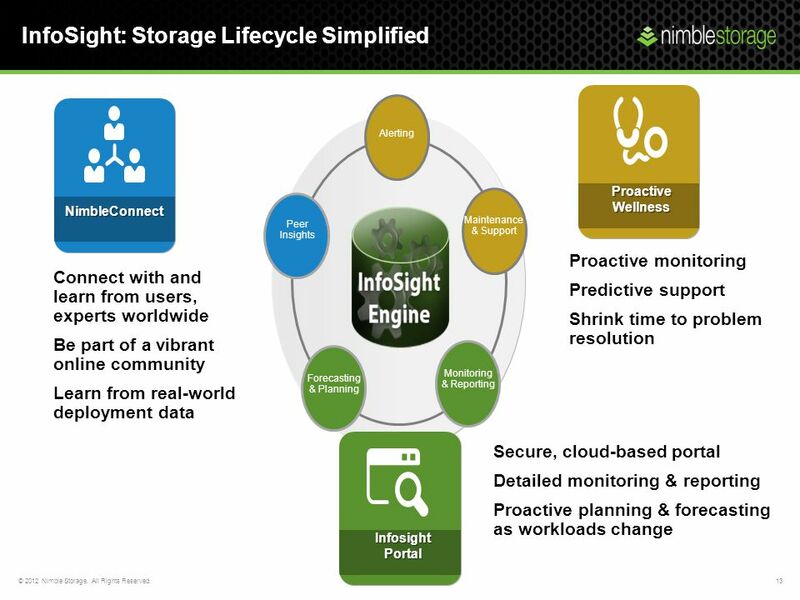 All Inclusive Software InfoSight: A revolutionary support portal for predictive analytics of data usage and growth. Easy to use: A Modern GUI and the option for self installation. Reliable: uptime for trailing twelve months. Tape, High- Capacity Disk Modular Monolithic LEGACY Archives OLTP SQL Server Exchange VDI SharePoint Web/File/Print Mainstream Applications Real-Time Analytics Cloud Hybrid Flash-Optimized MODERN Flash in Server All-Flash Arrays NEED FOR FLASH Next part of the positioning gets into workloads and how these were addressed in the pre-flash era. Point to note is that both the top and bottom tier of workloads are nichey in nature. 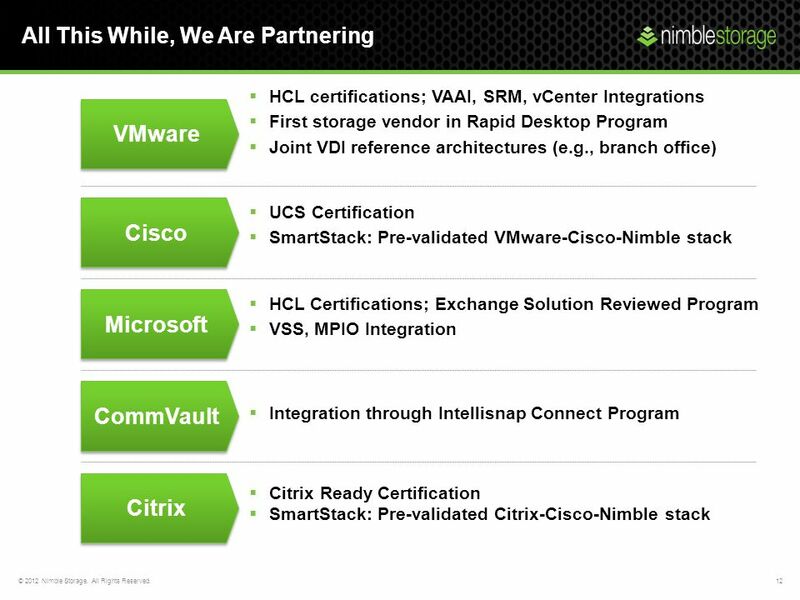 Bulk of the mainstream workloads are in that middle chunk. We believe the top tier will move to flash resident on server or all flash arrays. These are workloads that demand us latencies and >1M IOPS. Cost economics is not a major factor here. Long term archival and retention will likely move more to the cloud moving forward. 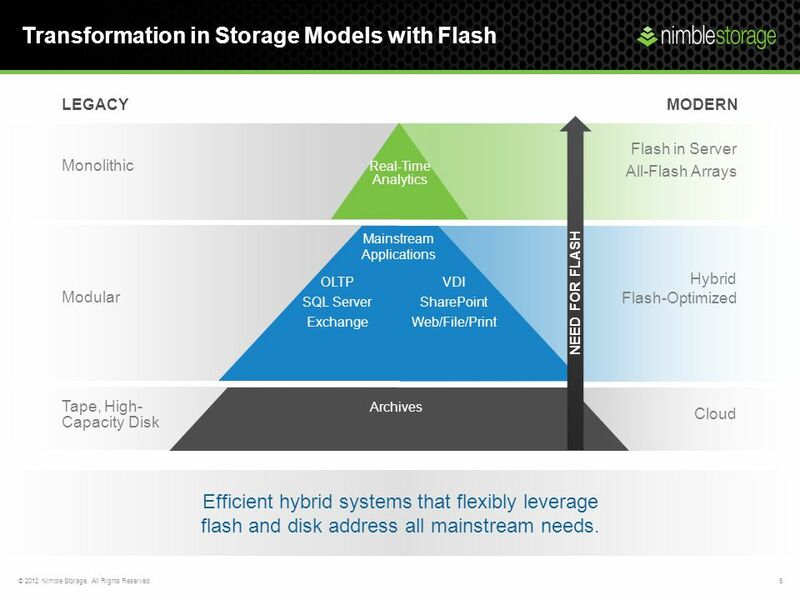 The middle chunk is best addressed by hybrid flash optimized storage. Specifically the performance demands of the workloads vary – eg VDI/OLTP much more performance centric vs Sharepoint. 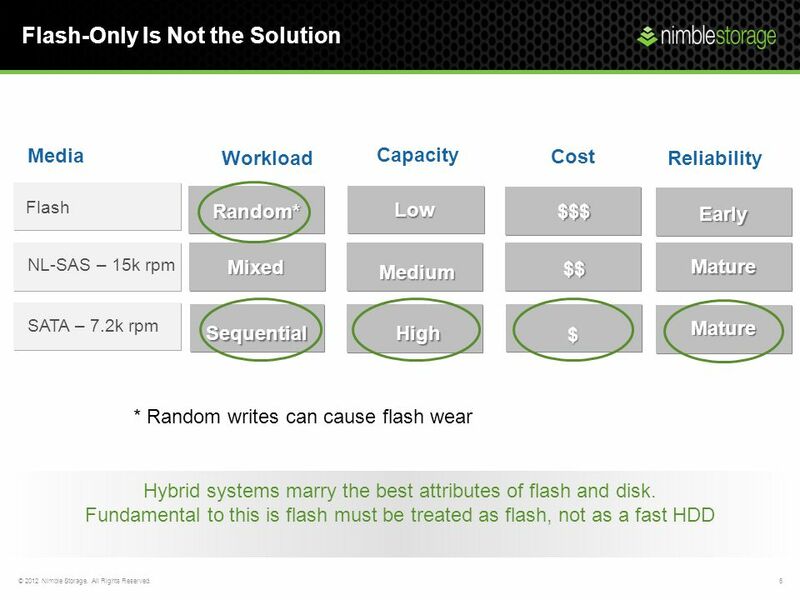 Bottomline: if you can architect a system which allows you to flexibly vary performance, you can cater to the needs of all mainstream workloads with a single storage architecture Efficient hybrid systems that flexibly leverage flash and disk address all mainstream needs. 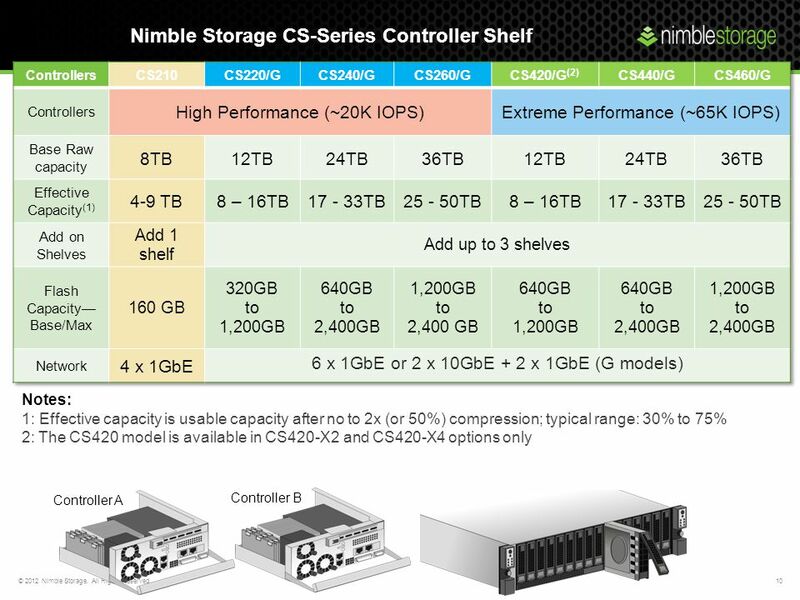 2-5x More Usable Capacity/$ 2-5x More Performance/$ High capacity disk Always-on compression, 2:1 real world High ratio of usable to raw capacity Arrays measured in “effective capacity” Responsive flash cache accelerates reads with no RAID overhead Serialized writes eliminate need for high RPM spindles 25-100k IOPS at sub-2ms latency DATA PROTECTION PERFORMANCE CAPACITY OPERATIONS CASL Integrated Data Protection Operational Efficiency The core mission for Nimble is to deliver efficiency. 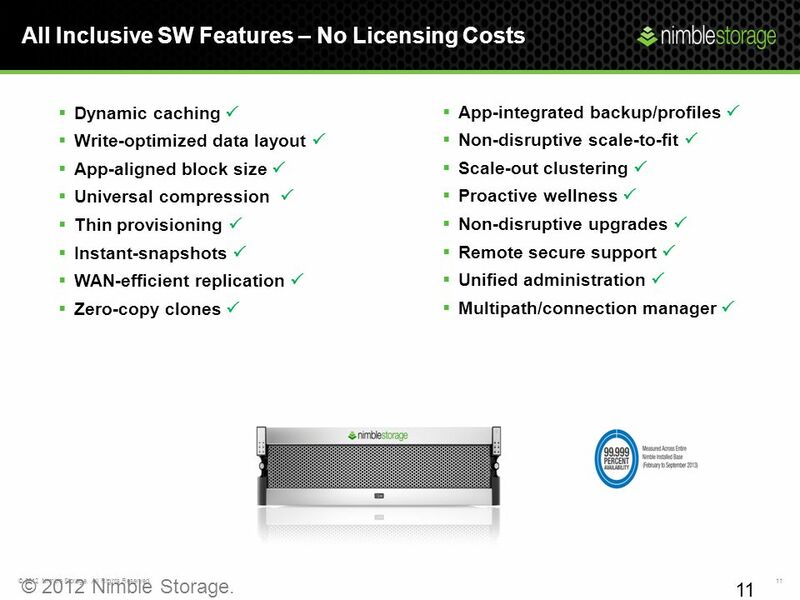 Nimble is “engineered for efficiency” This goes beyond just capacity savings. On the capacity front, talk about use of high capacity disk, always on compression and the ability to minimize overhead and deliver more usable to raw capacity Next we move onto performance. 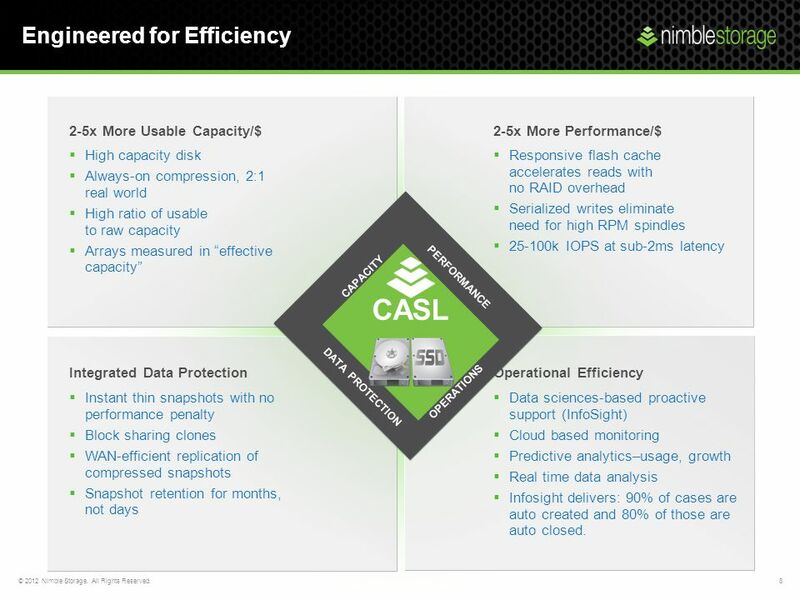 Talk about how CASL uses flash very effectively as cache eliminating RAID and write endurance overheads. Further, we are able to squeeze very high write performance from low rpm spindles On the data protection front, snapshots are very efficient from both a storage consumption as well as performance standpoint. Retaining snapshots for longer periods eliminates/mitigates the inefficiencies customers have to tolerate from legacy backup models. Finally replication is very efficient, only deltas go across. Lastly Nimble dramatically enhances operational efficiency through the use of data sciences. 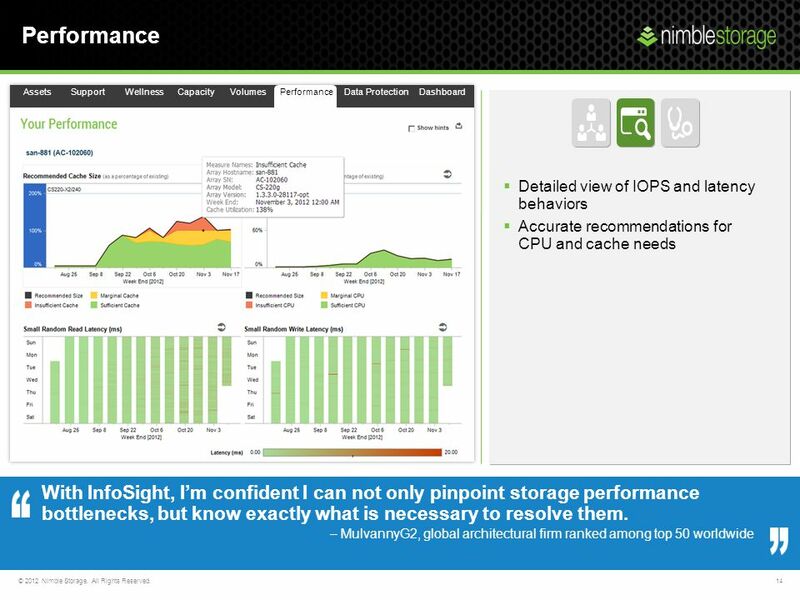 Instant thin snapshots with no performance penalty Block sharing clones WAN-efficient replication of compressed snapshots Snapshot retention for months, not days Data sciences-based proactive support (InfoSight) Cloud based monitoring Predictive analytics–usage, growth Real time data analysis Infosight delivers: 90% of cases are auto created and 80% of those are auto closed. Dynamic caching  Write-optimized data layout  App-aligned block size  Universal compression  Thin provisioning  Instant-snapshots  WAN-efficient replication  Zero-copy clones  App-integrated backup/profiles  Non-disruptive scale-to-fit  Scale-out clustering  Proactive wellness  Non-disruptive upgrades  Remote secure support  Unified administration  Multipath/connection manager  © 2012 Nimble Storage. Proprietary and confidential. Do not distribute. Download ppt "Nimble Scale to Fit Patrick Stack – Senior Storage Engineer"
Joey Yep Technical Marketing, Seagate CSS Creating a Competitive Advantage with Cloud. 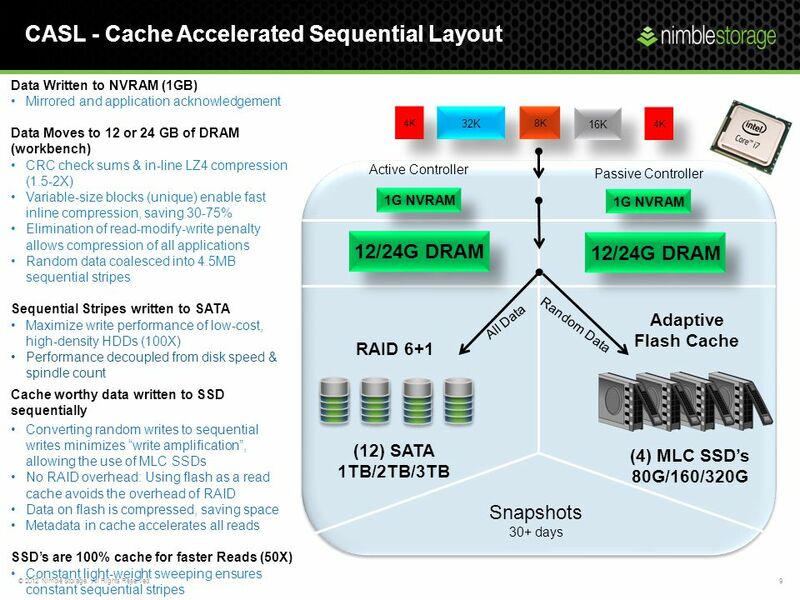 The All-Flash Array for the Next Generation Data Center SOLUTION OVERVIEW. Empowering Business in Real Time. © Copyright 2009, OSIsoft Inc. All rights Reserved. Virtualization and HA PI Systems: Three strategies to keep your PI. Rapidly growing installed base of over 600 customers and 1100 deployments Partner eco-system expanding quickly, with over 200 VARs Strong alliances with. Faster and Easier with Built-in Data Protection Ryan Troy – NorthEast System Engineering Manager 12/13/13. Windows Azure Conference 2014 Hybrid Cloud Storage: StorSimple and Windows Azure. Cisco and NetApp Confidential. Distributed under non-disclosure only. Name Date FlexPod Entry-level Solution FlexPod Value, Sized Right for Smaller Workloads. INTRODUCING COMPELLENT – FASTEST GROWING SAN VENDOR Virtualized storage for enterprises and cloud data centers. Addressing storage challenges with StorSimple Primary Storage Archival Storage Disk-based Backup Remote Replication Tape backup and DR Storage. Citrix Partner Update The Citrix Delivery Centre. VIR203.  Consolidation  Create economies of scale through standardization  Reduce IT costs  Deliver innovation  Enable flexibility  Ease of use.